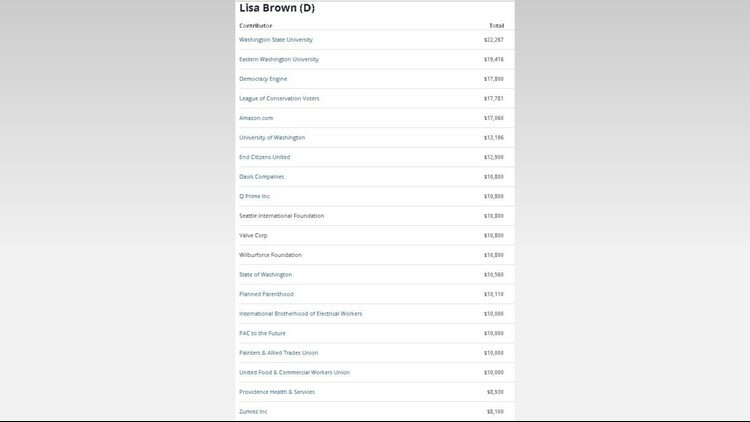 The latest data from the Federal Election Commission and the Center for Responsive Politics shows where campaign contributions are coming from for both Congresswoman Cathy McMorris Rodgers and candidate Lisa Brown. SPOKANE, Wash. — Editor's note: An earlier version of this article listed Schweitzer Engineering as a top contributor to McMorris Rodgers. The contributions are personal donations from founder Dr. Edmund Schweitzer, and not the company itself. One of the most heated races congressional races in America is the battle between current Congresswoman Cathy McMorris Rodgers (R-WA), and her Democratic challenger, former state senator and WSU-Spokane chancellor Lisa Brown. KREM 2 analyzed campaign contributions for both candidates. The latest data from the Federal Election Commission and the Center for Responsive Politics said the McMorris Rodgers campaign is getting 49 percent of her campaign contributions from in-state sources, and 51 percent from out-of-state. 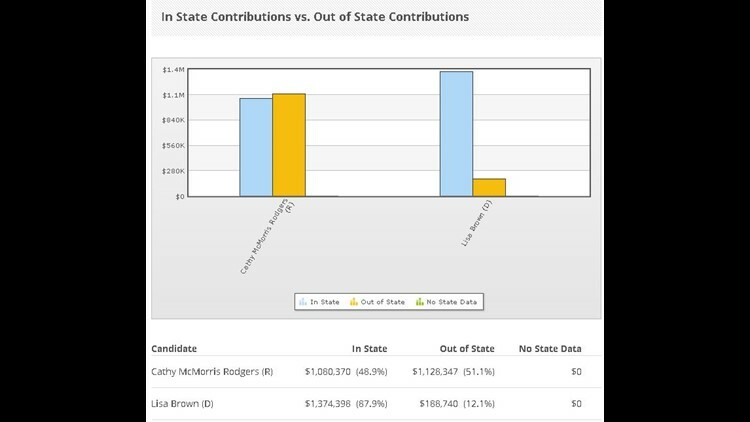 Comparatively, 88 percent of Brown's funds come from donors within Washington and 12 percent are from out-of-state. Within the 5th District, McMorris Rodgers is getting 22 percent of her campaign money from the area she represents, and the other 69 percent comes from outside of the district. For Brown, 47 percent comes from people and organizations within the 5th District and 43 percent comes from out of the district. More out-of-state contributions for an incumbent versus a challenger are not unusual. It's especially true for a candidate like McMorris Rodgers, who has been in office for more than a decade, simply because an incumbent makes a lot of connections during their considerable time in Washington D.C.
As for what industries are donating to each candidate’s campaign, for McMorris Rodgers, the top five are: securities/investments, retired individuals, health professional, real estate and pharmaceuticals/health products. 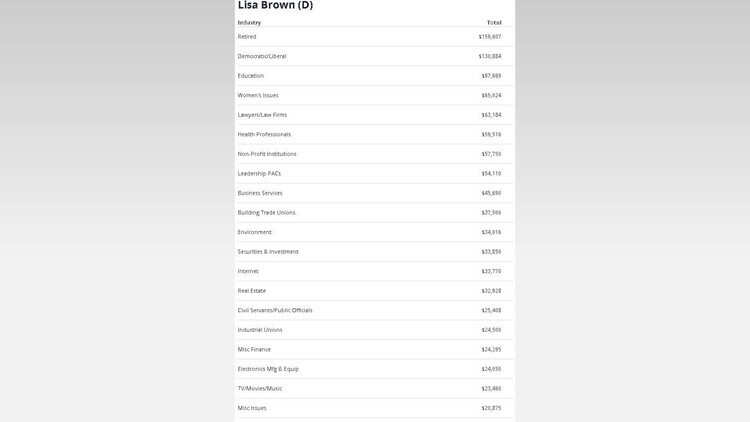 The top industries contributing to Brown's campaign are: retired individuals, democratic/liberal organizations, education, women’s issues and lawyers/law firms. 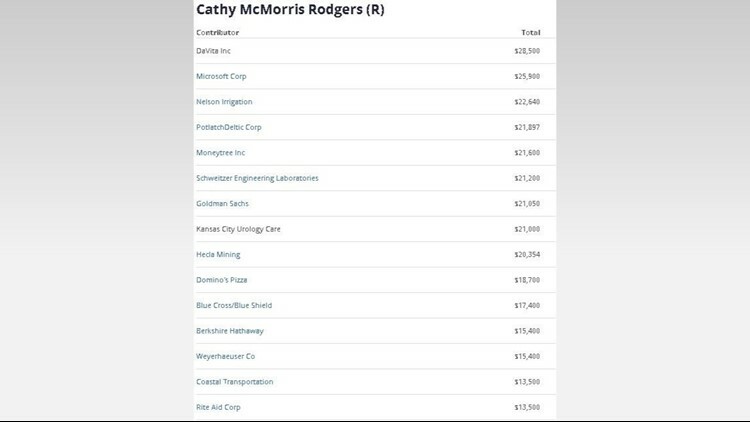 The top companies donating to Cathy McMorris Rogers's campaign are Goldman Sachs, Berkshire Hathaway, MoneyTree and Blue Cross Blue Shield. On Brown's side, the top businesses include universities -- Washington State University, Eastern Washington University and University of Washington -- as well as some of the more traditionally Democratic or liberal political organizations, such as PAC to the Future, End Citizens United, and the League of Conservation Voters. What does this mean? In general, it means these groups support each candidate's position on certain issues. The question is, will it influence voters' opinions of the candidates? McMorris Rodgers said both campaigns are reaching historical levels of funding for the 5th district. KREM 2 also looked at some of the local and regional organizations on the top 20 list of contributors for the candidates. 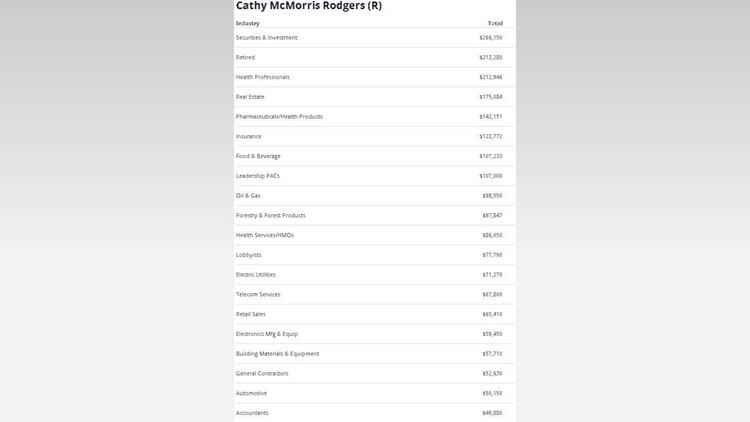 For McMorris Rodgers it includes Potlatch Deltic, Hecla Mining, Vaagen Brothers Lumber, Nelson Irrigation and Dr. Edmund Schweitzer, founder of Schweitzer Engineering. Brown’s list includes Amazon, Planned Parenthood, Providence, International Brotherhood of Electrical Workers, International Union of Painters and Allied Trades and United Food and Commercial Workers Union. It is very common for Democratic candidates to have significant contributions from trade unions like Food and Commercial Workers, Painters and Allied Trades, and Electrical Workers. Like any campaign, sometimes contributions are controversial, and this race is no different. McMorris Rodgers received contributions from pharmaceutical companies, but explained she supports generic prescriptions. Brown has also received controversial donations, including $10,000 from Planned Parenthood. “Well, I'm really clear: family planning and access to the full medical information for women, is very important. It's something that I believe is shared by most people here in Eastern Washington. I am proud to be a proud supporter of them. Representative McMorris Rodgers has supported a rule that would essentially deprive them of funding, not for the controversial abortion services, but for all their services. And that would cause people in Eastern Washington to lose access to health care that they really need,” Brown said. The two candidates differ widely, from their positions on certain issues to the way their campaigns are being funded. But both agree Washington needs more transparency when it comes to campaign funds.